George Parros announced his retirement today from the National Hockey League (NHL) after playing nine NHL seasons. TORONTO (December 5, 2014) – George Parros announced his retirement today from the National Hockey League (NHL) after playing nine NHL seasons. Parros played for five NHL teams, Los Angeles, Colorado, Anaheim, Florida and Montreal, during his career. He played in 474 regular season games, scoring 18 goals and adding 18 assists for 36 points, along with 1,092 penalty minutes. Parros, 34, was drafted by the Los Angeles Kings in the 8th round, 222nd overall in the 1999 NHL Entry Draft. Prior to his entry into the NHL, Parros played Division I NCAA hockey for four seasons with the Princeton Tigers where he was a three-time ECAC All-Academic team member. Following his successful collegiate career that saw him graduate with a degree in economics – he turned professional and joined the Manchester Monarchs of the American Hockey League near the end of the 2002-03 season. Parros would play two more seasons with the Monarchs before making the jump to the NHL in 2005-06, with the Los Angeles Kings. Parros suited-up in 55 games with the Los Angeles Kings in 2005-06, recording his first career NHL point on October 9, 2005. He finished the season with two goals and three assists along with 138 penalty minutes. Just prior to the 2006-07 season, Parros was claimed on waivers by the Colorado Avalanche. He only played two games with the Avalanche before being dealt to the Anaheim Ducks on November 13, 2006. It was in Anaheim where Parros made his biggest impact as an NHL player. He was a member of the Ducks for almost six seasons and became a fan favourite for his tough style of play and his ability to protect his teammates on the ice. Well-known for his trademark mustache and his long hair, the Anaheim Ducks team store sold “George Parros Mustaches” while he was with the team, with the proceeds going to charity. In the 2007 playoffs, Parros played in five games and he enjoyed the highlight of his career, raising the Stanley Cup with the Anaheim Ducks. 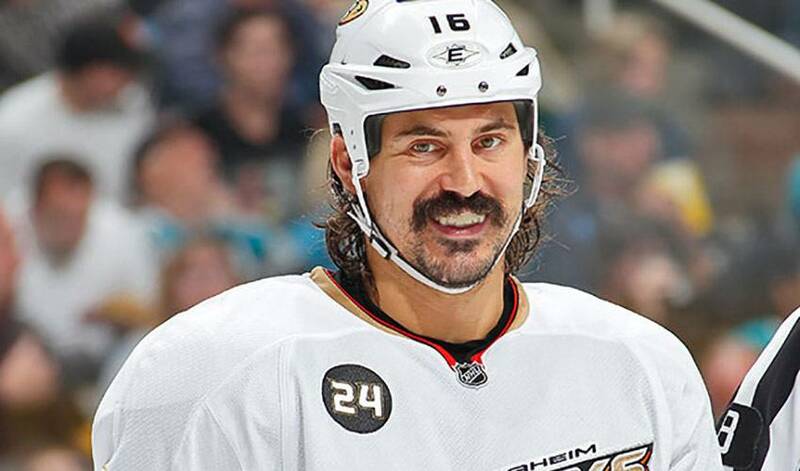 Parros signed with the Florida Panthers as a free agent on July 1, 2012, playing 39 games with the Panthers during the owners’ lockout-shortened 2012-13 season. After one season in the “Sunshine State”, he was traded to the Montreal Canadiens on July 5, 2013. With the Canadiens, Parros was injured on opening night of the 2013-14 season, but he returned to the team and played in 22 games. During his career, Parros was also an active member of the NHLPA. He served as an NHLPA player representative for four seasons while he was a member of the Anaheim Ducks, from October 2008 until October 2012. He also served as an alternate player representative in the 2012-13 season, while playing for the Panthers. In June 2012, with collective bargaining negotiations commencing, Parros was named to the NHLPA’s Negotiating Committee, and became one of the most active players during the negotiations, helping to reach a new CBA with the NHL owners. Born in Washington, PA, and raised in New Jersey, George and his wife Tiffany will now reside in Las Vegas with their two children.